In Fear and Trembling Kierkegaard, writing under the pseudonym Johannes de silentio, expounds his personal view of religion through a discussion of the scene in Genesis in which Abraham prepares to sacrifice his son at God's command. Believing Abraham's unreserved obedience to be the essential leap of faith needed to make a full commitment to his religion, Kierkegaard himself made great sacrifices in order to dedicate his life entirely to his philosophy and to God. The conviction shown in this religious polemic - that a man can have an exceptional mission in life - informed all Kierkegaard's later writings, and was also hugely influential for both Protestant theology and the existentialist movement. Alastair Hannay's introduction elucidates Kierkegaard's philosophy and the ways in which it conflicted with more accepted contemporary views. This edition also includes detailed notes to complement this groundbreaking analysis of religion, and new chronology. 176 pages, from Penguin. - Publisher Soren Aabye Kierkegaard was born in Copenhagen in 1813, the youngest of seven children. His mother, his sisters and two of his brothers all died before he reached his twenty-first birthday. Kierkegaard's childhood was an isolated and unhappy one, clouded by the religious fervour of his father. He was educated at the School of Civic Virtue and went on to enter the university, where he read theology but also studied the liberal arts and science. In all, he spent seven years as a student, gaining a reputation both for his academic brilliance and for his extravagant social life. Towards the end of his university career he started to criticize the Christianity upheld by his father and to look for a new set of values. In 1841 he broke off his engagement to Regine Olsen and devoted himself to his writing. During the next ten years he produced a flood of discourses and no fewer than twelve major philosophical essays, many of them written under noms de plume. Notable are Either/Or (1843), Repetition (1843), Fear and Trembling (1843), Philosophical Fragments (1844), The Concept of Anxiety (1844), Stages on Life's Way (1845), Concluding Unscientific Postscript (1846) and The Sickness unto Death (1849). By the end of his life Kierkegaard had become an object of public ridicule and scorn, partly because of a sustained feud that he had provoked in 1846 with the satirical Danish weekly the Corsair, partly because of his repeated attacks on the Danish State Church. Few mourned his death in November 1855, but during the early twentieth century his work enjoyed increasing acclaim and he has done much to inspire both modern Protestant theology and existentialism. Today Kierkegaard is attracting increasing attention from philosophers and writers 'inside' and outside the postmodern tradition. Alastair Hannay was born to Scottish parents in Plymouth, Devon, in 1932 and educated at the Edinburgh Academy, the University of Edinburgh and University College London. In 1961 he became a resident of Norway, where he is now Emeritus Professor of Philosophy at the University of Oslo. A Fellow of the Royal Society of Edinburgh, he has been a frequent visiting professor at the University of California, at San Diego and at Berkeley. Alastair Hannay has also translated Kierkegaard's Either/Or, The Sickness unto Death, Papers and Journals and A Literary Review for Penguin Classics. His other publications include Mental Images - A Defence, Kierkegaard (Arguments of the Philosophers), Human Consciousness and Kierkegaard: A Biography, as well as articles on diverse themes in philosophical collections and journals. He is the editor of Inquiry. 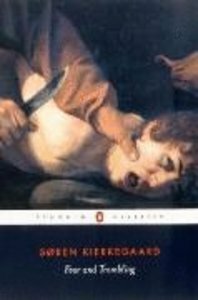 About "Fear and Trembling (Penguin Black Classics Series)"
Soren Aabye Kierkegaard was born in Copenhagen in 1813, the youngest of seven children. His mother, his sisters and two of his brothers all died before he reached his twenty-first birthday. Kierkegaard's childhood was an isolated and unhappy one, clouded by the religious fervour of his father. He was educated at the School of Civic Virtue and went on to enter the university, where he read theology but also studied the liberal arts and science. In all, he spent seven years as a student, gaining a reputation both for his academic brilliance and for his extravagant social life. Towards the end of his university career he started to criticize the Christianity upheld by his father and to look for a new set of values. In 1841 he broke off his engagement to Regine Olsen and devoted himself to his writing. During the next ten years he produced a flood of discourses and no fewer than twelve major philosophical essays, many of them written under noms de plume. Notable are Either/Or (1843), Repetition (1843), Fear and Trembling (1843), Philosophical Fragments (1844), The Concept of Anxiety (1844), Stages on Life's Way (1845), Concluding Unscientific Postscript (1846) and The Sickness unto Death (1849). By the end of his life Kierkegaard had become an object of public ridicule and scorn, partly because of a sustained feud that he had provoked in 1846 with the satirical Danish weekly the Corsair, partly because of his repeated attacks on the Danish State Church. Few mourned his death in November 1855, but during the early twentieth century his work enjoyed increasing acclaim and he has done much to inspire both modern Protestant theology and existentialism. Today Kierkegaard is attracting increasing attention from philosophers and writers 'inside' and outside the postmodern tradition. Alastair Hannay was born to Scottish parents in Plymouth, Devon, in 1932 and educated at the Edinburgh Academy, the University of Edinburgh and University College London. In 1961 he became a resident of Norway, where he is now Emeritus Professor of Philosophy at the University of Oslo. A Fellow of the Royal Society of Edinburgh, he has been a frequent visiting professor at the University of California, at San Diego and at Berkeley. Alastair Hannay has also translated Kierkegaard's Either/Or, The Sickness unto Death, Papers and Journals and A Literary Review for Penguin Classics. His other publications include Mental Images - A Defence, Kierkegaard (Arguments of the Philosophers), Human Consciousness and Kierkegaard: A Biography, as well as articles on diverse themes in philosophical collections and journals. He is the editor of Inquiry. SOren Kierkegaard (1813-1855) lived in Copenhagen, Denmark. His books include "Works of Love" and "Spiritual Writings" (translated and edited by George Pattison).